- Welcome - Click Here To Begin Heading-N7.56 E5.89 Status: Target Screen Engaged Active Targeting: On Next Target :W34.345 N24.234 Fueling Finishing. 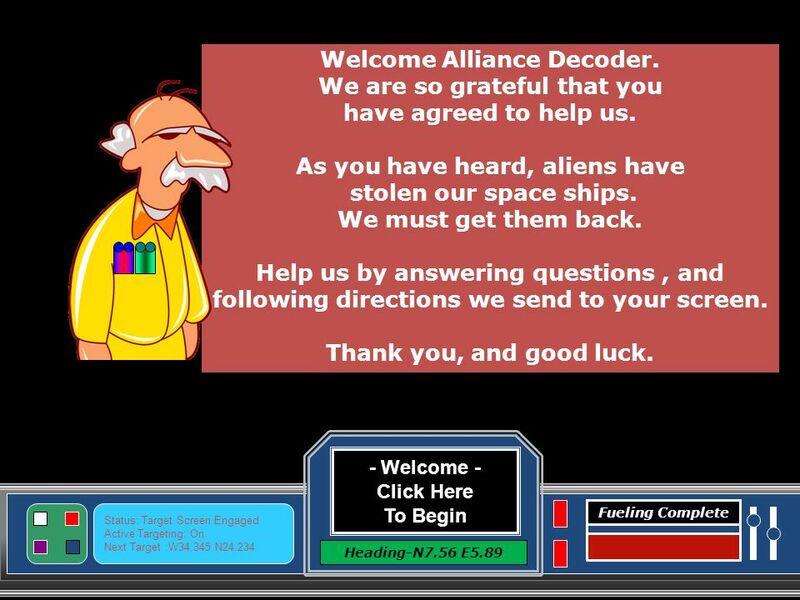 3 - Welcome - Click Here To Begin Heading-N7.56 E5.89 Status: Target Screen Engaged Active Targeting: On Next Target :W34.345 N24.234 Fueling Complete Welcome Alliance Decoder. We are so grateful that you have agreed to help us. As you have heard, aliens have stolen our space ships. We must get them back. Help us by answering questions, and following directions we send to your screen. Thank you, and good luck. 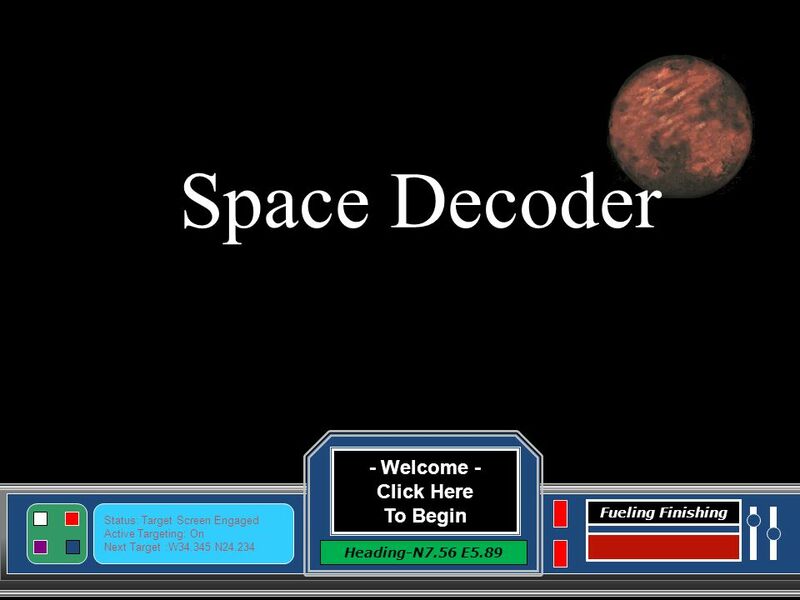 4 Level Complete Click here to Continue Heading-N7.56 E5.89 Status: Target Screen Engaged Active Targeting: On Next Target :W34.345 N24.234 Time Remaining Level One - Instructions Click the Space Ships to make them disappear. Click the Space Ships to make them disappear. 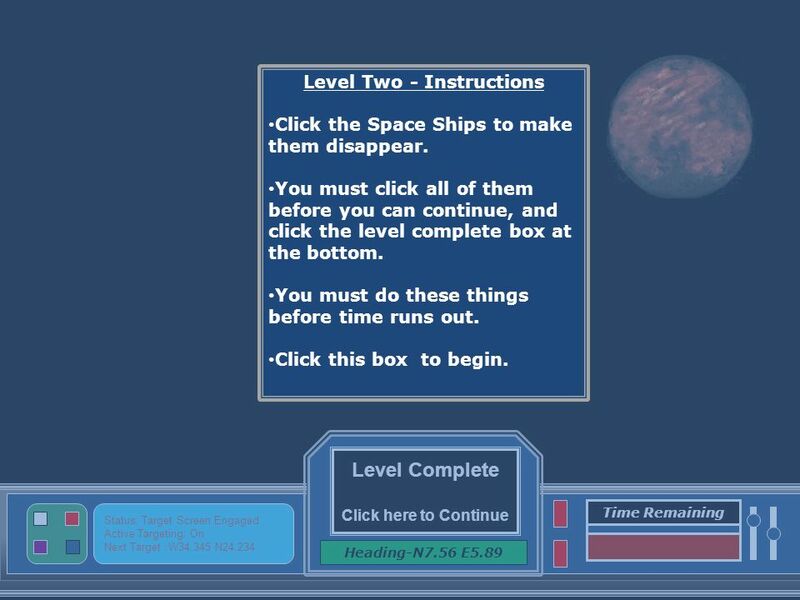 You must click all of them before you can continue, and click the level complete box at the bottom. 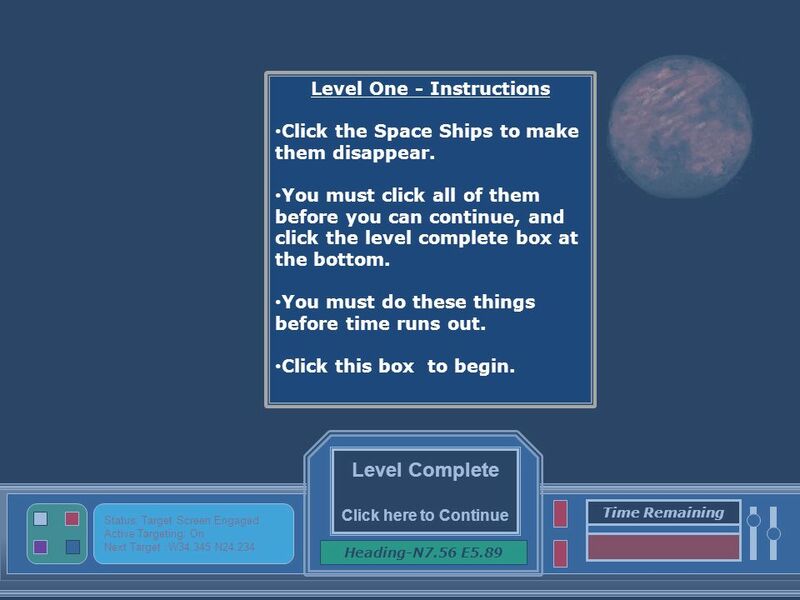 You must click all of them before you can continue, and click the level complete box at the bottom. You must do these things before time runs out. You must do these things before time runs out. Click this box to begin. 7 Click Here To Try Again Heading-N7.56 E5.89 Status: Target Screen Engaged Active Targeting: On Next Target :W34.345 N24.234 Fueling Complete Looks like you couldnt complete Level One. Please go back and try it again. The fate of our planet rests on your shoulders. 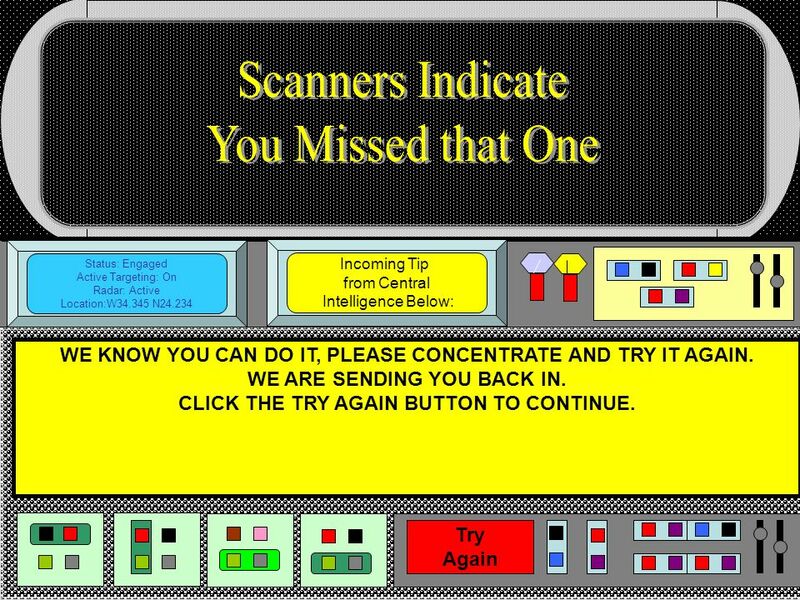 8 Click Here To Continue Heading-N7.56 E5.89 Status: Target Screen Engaged Active Targeting: On Next Target :W34.345 N24.234 Fueling Complete Excellent Work! I knew we could count on you to get the job done. 9 Click Letter Above To Answer Question Heading-N7.56 E5.89 Status: Target Screen Engaged Active Targeting: On Next Target :W34.345 N24.234 Damage Indicator ¿Cómo estás? A.Estás bien. ¿Y tú? B.Estoy muy bien gracias. C. Me llamo Juan. D. Hola Señora Mongiello ABCD Great Job! Click here to keep going. 10 Click Letter Above To Answer Question Heading-N7.56 E5.89 Status: Target Screen Engaged Active Targeting: On Next Target :W34.345 N24.234 Damage Indicator Next Question… ¿Cómo te llamas? A. Mi llamo _______. B. Me llamas __________. C. Me llamo ____________. D. Me llamo es _______________. ABCD Great Job! Click here to keep going. 11 Click Letter Above To Answer Question Heading-N7.56 E5.89 Status: Target Screen Engaged Active Targeting: On Next Target :W34.345 N24.234 Damage Indicator Next Question… ¿De dónde eres? A. Yo soy Masachusetts. B. Yo vivo en Weston. 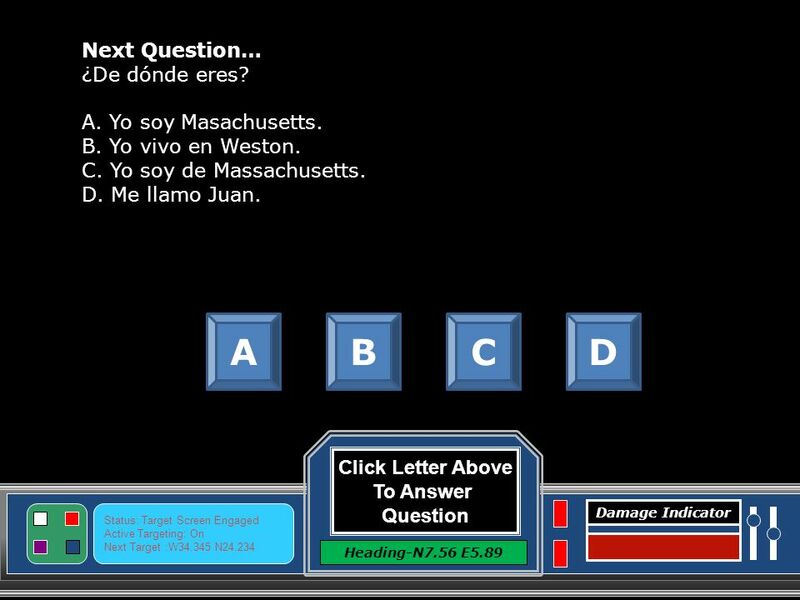 C. Yo soy de Massachusetts. D. Me llamo Juan. ABCD Great Job! Click here to keep going. 12 Click Letter Above To Answer Question Heading-N7.56 E5.89 Status: Target Screen Engaged Active Targeting: On Next Target :W34.345 N24.234 Damage Indicator Next Question… ¿Cuántos años tienes? A. Yo tengo once años. B. Mi cumpleaños es el once de junio. C. Yo soy once años. D. yo tengo 11 anos ABCD Great Job! Click here to keep going. 13 Click Letter Above To Answer Question Heading-N7.56 E5.89 Status: Target Screen Engaged Active Targeting: On Next Target :W34.345 N24.234 Damage Indicator Next Question… ¿Cuándo es tu cumpleaños? A. mi cumpleanos es el veintinueve de Mayo. B. Yo tengo once años. C. Mi cumpleaños es veintinueve de Mayo. D. Mi cumpleaños es el veintinueve de mayo. ABCD Great Job! Click here to keep going. 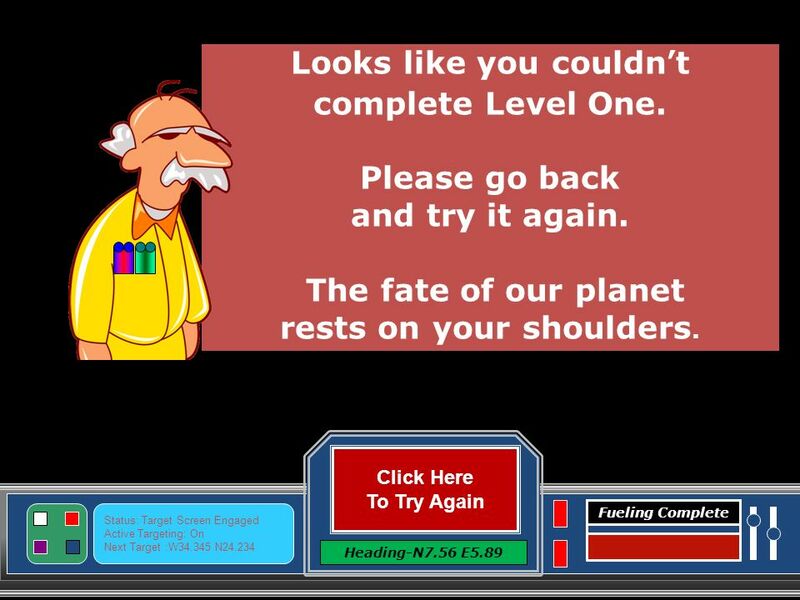 14 Level Complete Click here to Continue Heading-N7.56 E5.89 Status: Target Screen Engaged Active Targeting: On Next Target :W34.345 N24.234 Time Remaining Level Two - Instructions Click the Space Ships to make them disappear. Click the Space Ships to make them disappear. 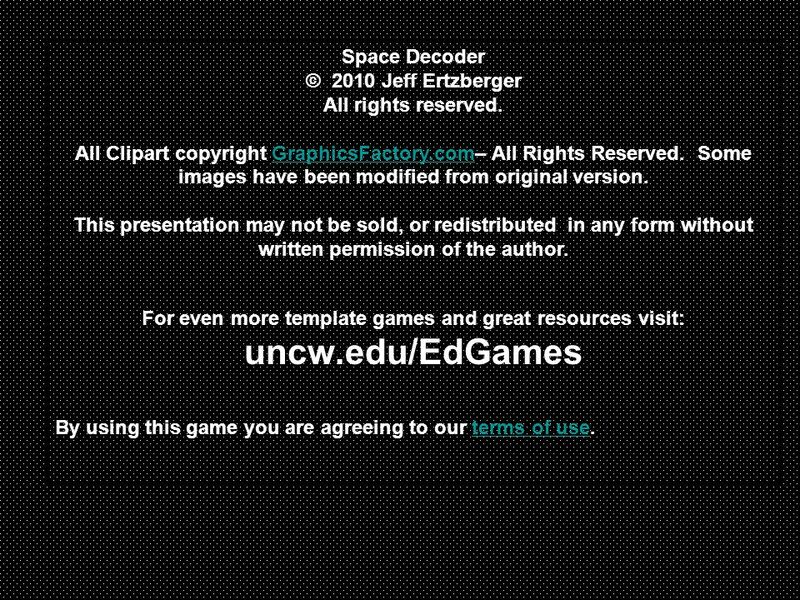 You must click all of them before you can continue, and click the level complete box at the bottom. 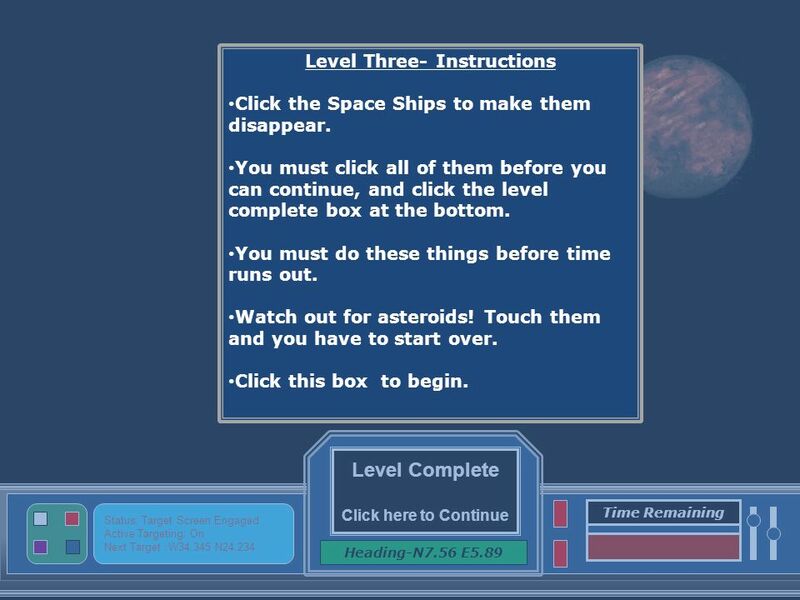 You must click all of them before you can continue, and click the level complete box at the bottom. You must do these things before time runs out. You must do these things before time runs out. Click this box to begin. 17 Click Here To Try Again Heading-N7.56 E5.89 Status: Target Screen Engaged Active Targeting: On Next Target :W34.345 N24.234 Fueling Complete Looks like you couldnt complete Level Two. Please go back and try it again. The fate of our planet rests on your shoulders. 18 Click Here To Continue Heading-N7.56 E5.89 Status: Target Screen Engaged Active Targeting: On Next Target :W34.345 N24.234 Fueling Complete Excellent Work! I knew we could count on you to get the job done. 19 Click Letter Above To Answer Question Heading-N7.56 E5.89 Status: Target Screen Engaged Active Targeting: On Next Target :W34.345 N24.234 Damage Indicator Next Question… Hoy es martes. ¿Qué día fue ayer? A. Lunes fue ayer. B. Ayer fue miércoles. C. Ayer fue lunes. D. Hoy es martes. ABCD Great Job! Click here to keep going. 20 Click Letter Above To Answer Question Heading-N7.56 E5.89 Status: Target Screen Engaged Active Targeting: On Next Target :W34.345 N24.234 Damage Indicator Next Question… Hoy es jueves. ¿Qué día será mañana? A. Mañana será viernes. B. Ayer fue miércoles. C. Manana sera sabado. D. Manana sera viernes. ABCD Great Job! Click here to keep going. 21 Click Letter Above To Answer Question Heading-N7.56 E5.89 Status: Target Screen Engaged Active Targeting: On Next Target :W34.345 N24.234 Damage Indicator Next Question… Ayer fue viernes. ¿Qué día será mañana? A. Mañana será viernes. B. Mañana será domingo. C. Hoy es sábado. D. Ayer será domingo. ABCD Great Job! Click here to keep going. 22 Click Letter Above To Answer Question Heading-N7.56 E5.89 Status: Target Screen Engaged Active Targeting: On Next Target :W34.345 N24.234 Damage Indicator Complete the dialogue…(Completa el diálago) Hola, buenos días ________________ ¿Cómo te llamas? Me llamo Amy. ¿De dónde eres? Yo soy de Boston. A. Bien gracias, ¿Y usted? B. Hola, buenos días. C. Igualmente. D. Mucho gusto. ABCD Great Job! Click here to keep going. 23 Click Letter Above To Answer Question Heading-N7.56 E5.89 Status: Target Screen Engaged Active Targeting: On Next Target :W34.345 N24.234 Damage Indicator Complete the dialogue…(Completa el diálago) Hola, buenos días Hola, buenos días. ¿Cómo te llamas? Me llamo Amy. ______________ Estoy bien gracias. ¿De dónde eres? Yo soy de Boston. A. Como estas B. ¿Cómo están? C. ¿Cómo te llamas? D. ¿Cómo estás? ABCD Great Job! Click here to keep going. 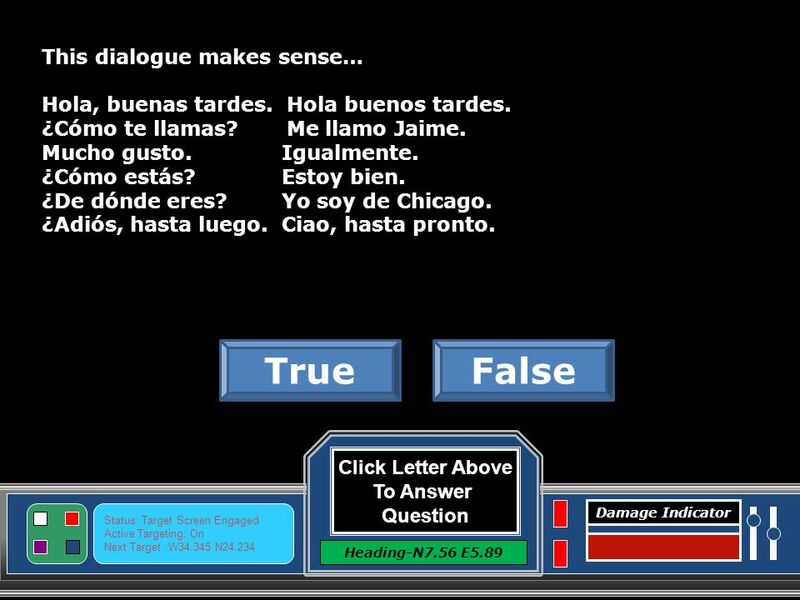 24 Click Letter Above To Answer Question Heading-N7.56 E5.89 Status: Target Screen Engaged Active Targeting: On Next Target :W34.345 N24.234 Damage Indicator This dialogue makes sense… Hola, buenas tardes. Hola buenos tardes. ¿Cómo te llamas? Me llamo Jaime. Mucho gusto.Igualmente. ¿Cómo estás?Estoy bien. ¿De dónde eres?Yo soy de Chicago. ¿Adiós, hasta luego.Ciao, hasta pronto. FalseTrue Great Job! Click here to keep going. 25 Click Letter Above To Answer Question Heading-N7.56 E5.89 Status: Target Screen Engaged Active Targeting: On Next Target :W34.345 N24.234 Damage Indicator FalseTrue Great Job! Click here to keep going. This dialogue makes sense… Hola, buenas tardes. Hola buenos tardes. ¿Cómo te llamas? Estoy bien gracias. Mucho gusto.Igualmente. ¿Cómo estás?Me llamo Jaime. ¿De dónde eres?Yo soy de Chicago. ¿Adiós, hasta luego.Ciao, hasta pronto. 26 Level Complete Click here to Continue Heading-N7.56 E5.89 Status: Target Screen Engaged Active Targeting: On Next Target :W34.345 N24.234 Time Remaining Level Three- Instructions Click the Space Ships to make them disappear. Click the Space Ships to make them disappear. You must click all of them before you can continue, and click the level complete box at the bottom. You must click all of them before you can continue, and click the level complete box at the bottom. You must do these things before time runs out. You must do these things before time runs out. Watch out for asteroids! Touch them and you have to start over. Watch out for asteroids! Touch them and you have to start over. Click this box to begin. 29 Click Here To Try Again Heading-N7.56 E5.89 Status: Target Screen Engaged Active Targeting: On Next Target :W34.345 N24.234 Fueling Complete Looks like you couldnt complete Level Three. Please go back and try it again. The fate of our planet rests on your shoulders. 30 Click Here To Continue Heading-N7.56 E5.89 Status: Target Screen Engaged Active Targeting: On Next Target :W34.345 N24.234 Fueling Complete Excellent Work! 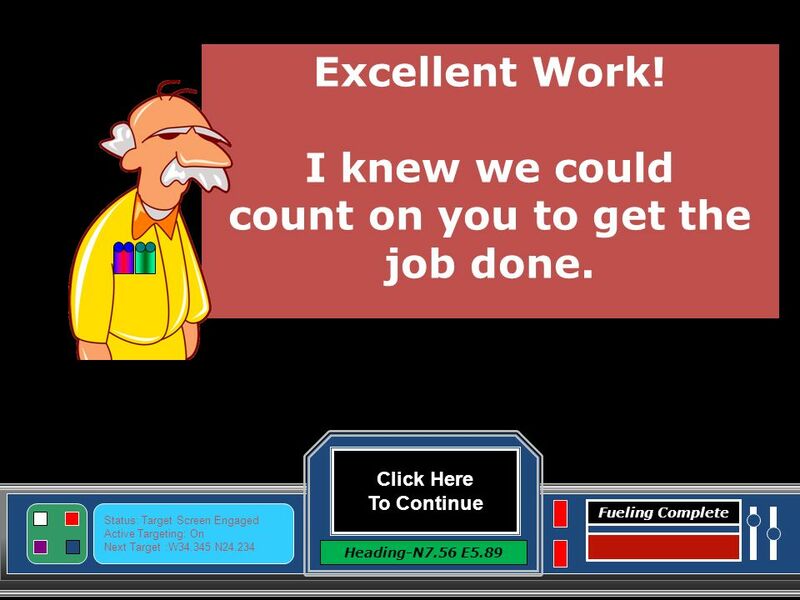 I knew we could count on you to get the job done. 31 Click Here To End Game Heading-N7.56 E5.89 Status: Target Screen Engaged Active Targeting: On Next Target :W34.345 N24.234 Fueling Complete Thank You! 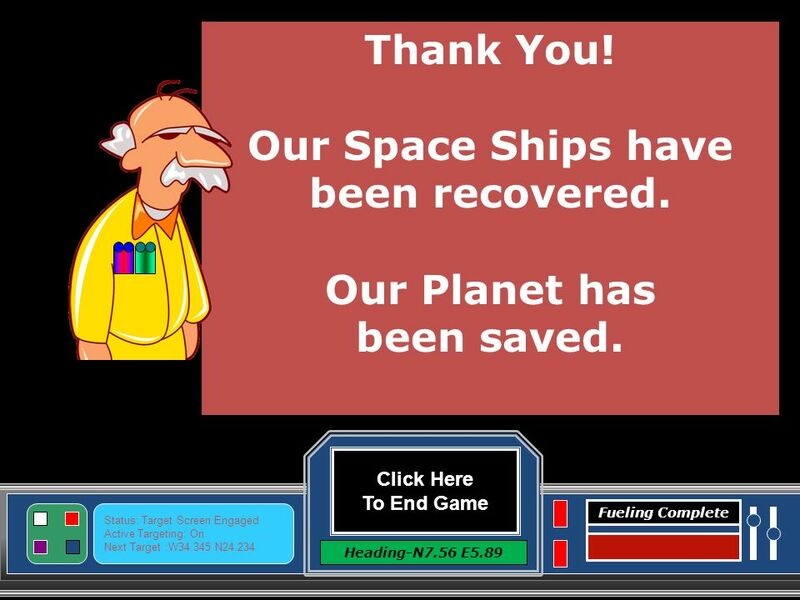 Our Space Ships have been recovered. Our Planet has been saved. Descargar ppt "- Welcome - Click Here To Begin Heading-N7.56 E5.89 Status: Target Screen Engaged Active Targeting: On Next Target :W34.345 N24.234 Fueling Finishing." 3/24/2017 Los Saludos y Más. Communicative Spanish Background- Intros-. What to cover? Communicative SpanishCommunicative Spanish VocabVocab ConjugationConjugation Parts of speech. Escriban (escribir) Write an in which you introduce yourself to a prospective pen pal. Prewrite-think about information you want to give. Answer. How do we say “hello” & “goodbye” in Spanish?